Palestine, 1941. In the small village of Ein Hod a father leads a procession of his family and workers through the olive groves. As they move through the trees the green fruits drop onto the orchard floor; the ancient cycle of the seasons providing another bountiful harvest. 1948. The Abulheja family are forcibly removed from their ancestral home in Ein Hod and sent to live in a refugee camp in Jenin. Through Amal, the bright granddaughter of the patriarch, we witness the stories of her brothers: one, a stolen boy who becomes an Israeli soldier; the other who in sacrificing everything for the Palestinian cause will become his enemy. Amal's own dramatic story threads its way through six decades of Palestinian-Israeli tension, eventually taking her into exile in Pensylvania in America. Amal's is a story of love and loss, of childhood, marriage and parenthood, and finally the need to share her history with her daughter, to preserve the greatest love she has. 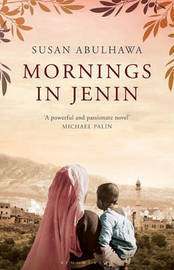 Richly told and full of humanity, "Mornings in Jenin" forces us to take a fresh look at one of the defining political conflicts of our lifetime. It is an extraordinary debut. Susan Abulhawa was born to refugees of the Six Day War of 1967, when her family's land was seized and Israel captured what remained of Palestine, including Jerusalem. She moved to the USA as a teenager, graduated in biomedical science and established a career in medical science. In July 2001, Susan Abulhawa founded Playgrounds for Palestine, a children's organisation dedicated to upholding The Right to Play for Palestinian children. Mornings in Jenin is her first novel and is being published in nineteen countries. She lives in Pennsylvania with her daughter.